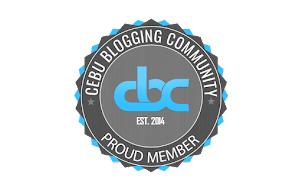 I recently got invited to check out another restaurant at The Gallery in Mabolo. I immediately said yes because The Gallery has been the home to several interesting restaurants. The name of the latest establishment that I have tried is F Café and Bar. I expected it to be the typical run of the mill bar/café that offer fatty dishes to cater to a crowd interested in booze, as well as, food. Well, I was totally wrong and really glad that I was. 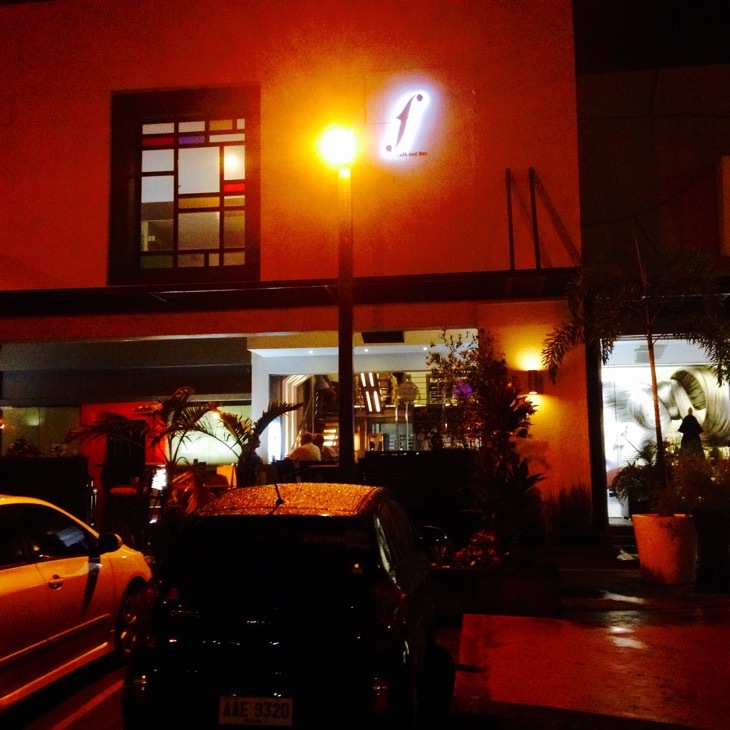 F Café and Bar is owned by Francis Lee, the owner of the posh salon beside it. There are so many F’s that I can think of when I reminisced about my first visit to this restaurant. Fine, Flashy, Fashionable, Fabulous, Fun, and Flavorful. It’s really a fantastic place to dine or even hang out past dinner. The head chef of this place is the brilliant young chef Jay Jonson, who teaches in the nearby culinary school (Academy for International Culinary Arts). The dishes at F Café and Bar are absolutely Fashionable, Flavorful and Fun to eat. The creations of Chef Jay are nice to look at and once you taste it, you can expect probably some “#foodgasm”. I was fortunate to taste a vast majority of the courses in the menu and I made a personal "Fine Fifteen" list. 15. 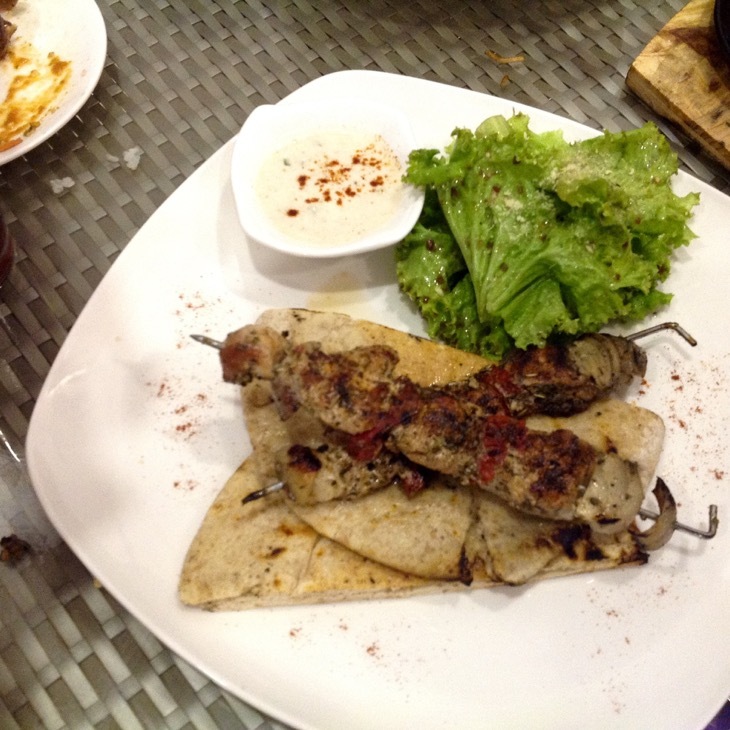 F Chicken Kebab (Php240) – Two skewers of perfectly grilled chicken breast served with pita bread, Mediterranean Side Salad, and Tzatziki. This Greek/Middle Eastern specialty is highly recommended for the weight conscious. At 240 pesos only, it is a solid chicken kebab served in a very chic place. 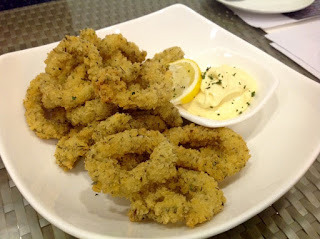 14.Calamares (Php 220) – Deep fried marinated squid served with a honey mustard aioli. F Cafe and Bar's Calamari is herby, crispy, and cooked just right. This versatile dish is an excellent appetizer, side dish, or beer mate. 13. 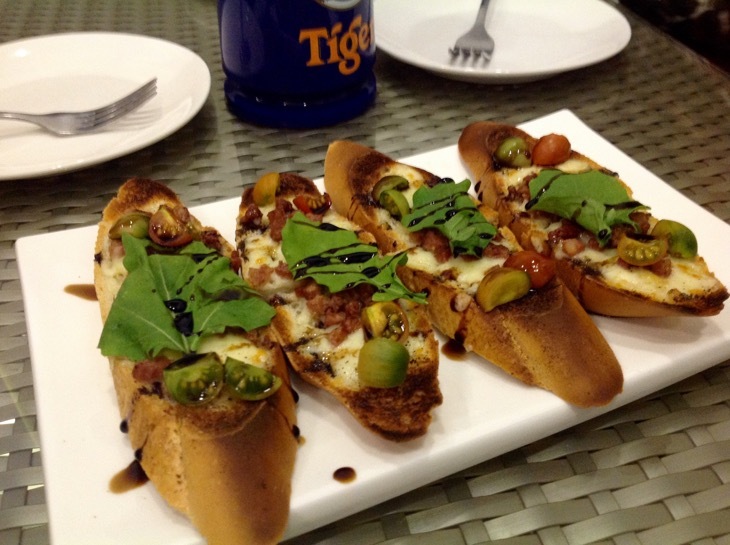 Pizza Bruschetta (Php 170) – French Baguette topped with mozzarella cheese, chorizo, arugula, and sliced cherry tomatoes then drizzled with a balsamic reduction. It is like an homage to the Arugula Pizza at the nearby La Bella Pizza Bistro done with some flair. The pizza bruschetta is basically a salad on a bread with some cheese and meat, which makes it a fascinating appetizer. It is one of the best antipastos in the menu. 12. 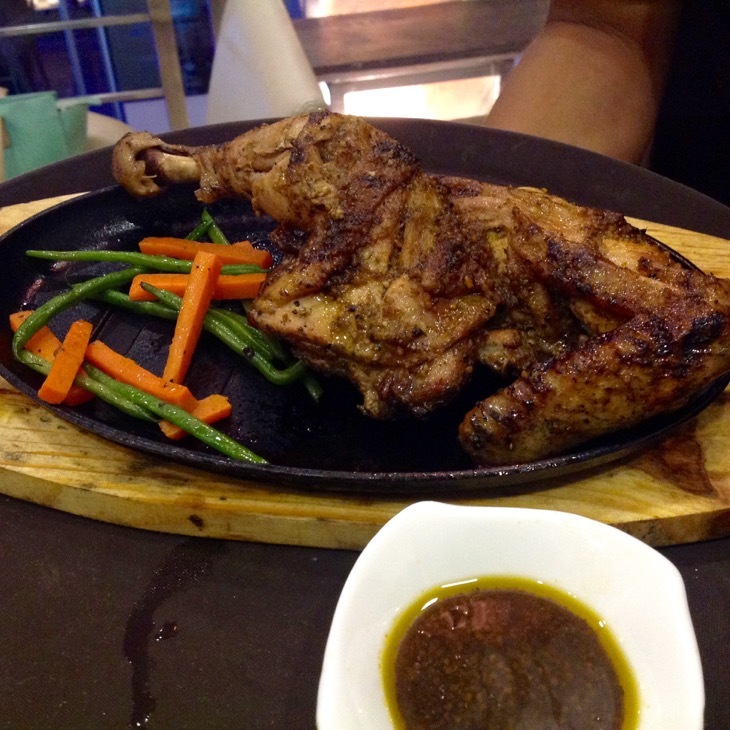 Grilled Piri-Piri Chicken (Half-285/Quarter - 180) – Portuguese Piri-Piri Chicken served on a sizzling plate with garlic vegetables and F Cafe's Piri-Piri Sauce. 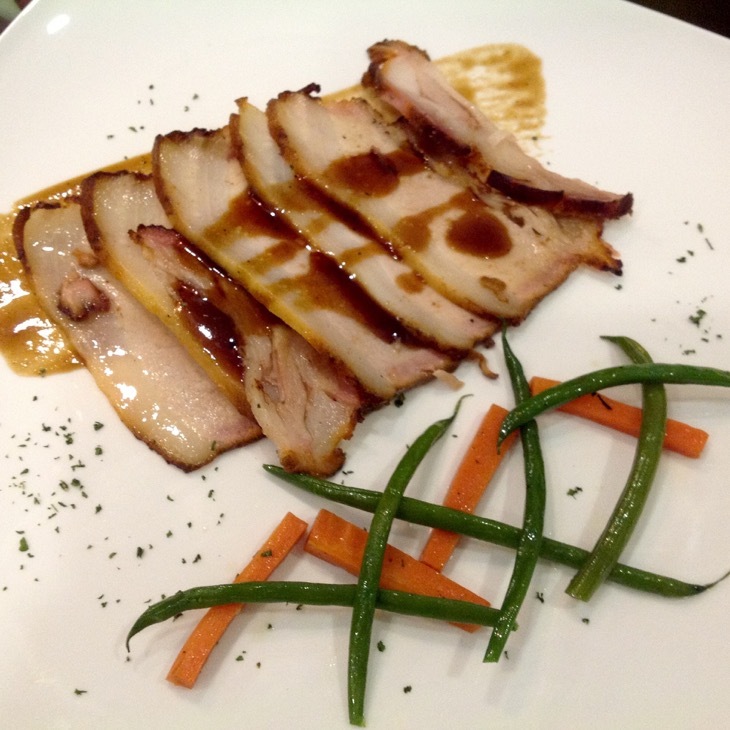 This dish highlights Chef Jay Jonson's vast culinary knowledge even at such a young age. F Cafe and Bar's Piri-Piri Chicken is a fashionable version of our very own "lechon manok". The Portuguese Grilled Chicken is appetizing even without the sauce. It is peppery and I like how it is seasoned. 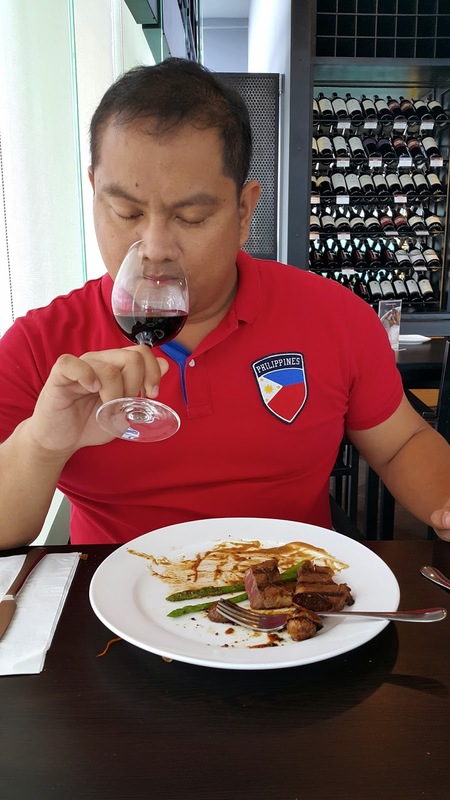 The sauce is quite acidic with a hint of spiciness. 11. F Beef Kebab (270 Php) – A pair of skewered grilled hanging tender served with Pita bread, side salad, and Tzatziki. 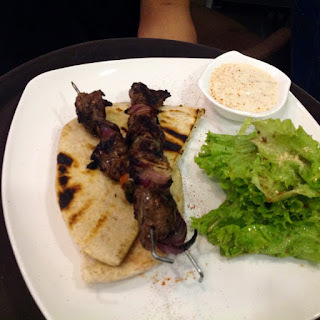 F Cafe uses a very flavorful cut of beef, which will leave you wanting some more. I love beef so I prefer this over the chicken version. 10.Penne Arrabiata with Sausage and Mozzarella (Php 240) – Penne Pasta with a spicy tomato sauce and Italian sausage served with Garlic Bread. 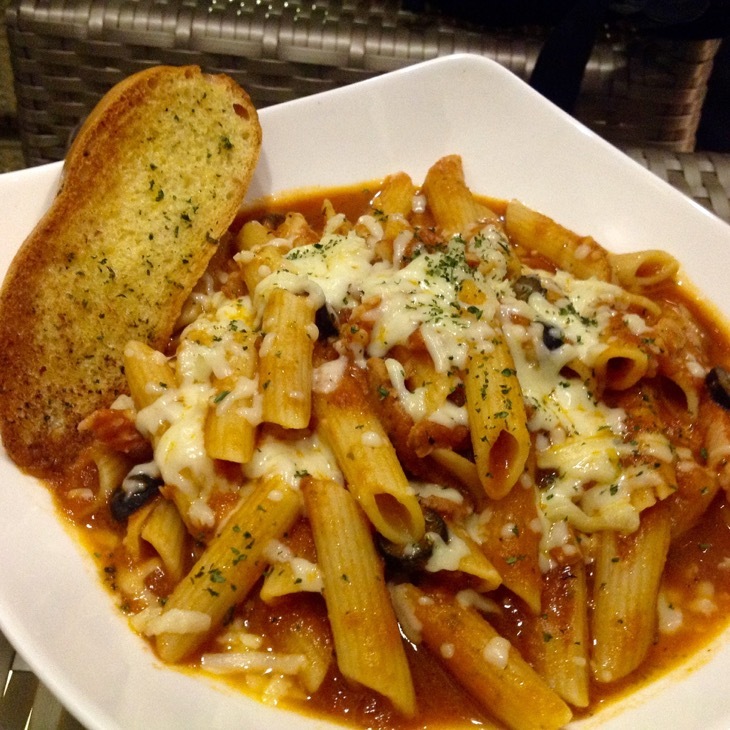 If you love pasta, this place also serves some delightful pasta dishes. The penne is al dente. I expected the sauce to be an "angry" sauce, but I was pleasantly surprised that it was mild and even has hints of sweetness probably from the sausages. 9. 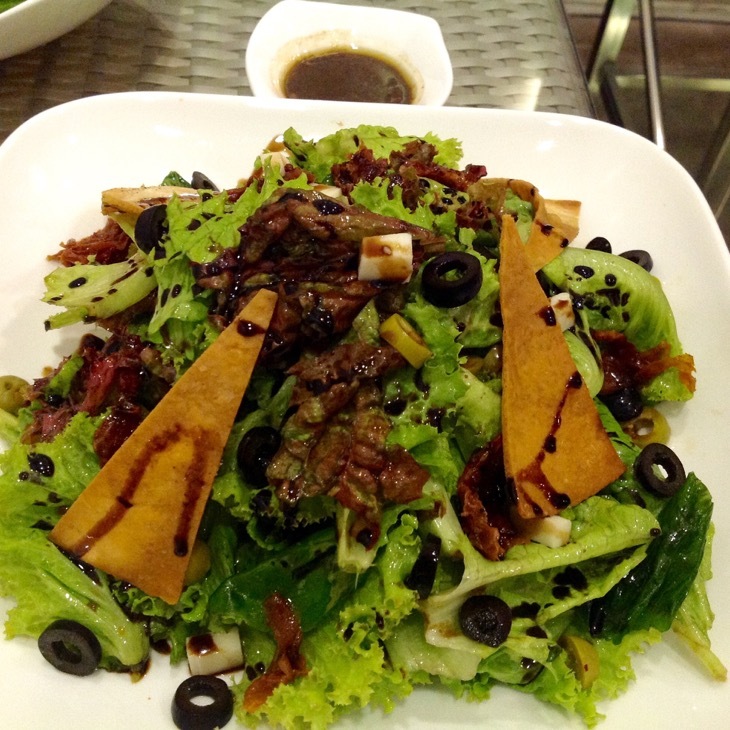 Mediterranean Salad (Php 280) – A salad of Arugula, lollo rosso, romaine lettuce, sundried tomatoes, candied walnuts, olives, goat cheese and parmigiano reggiano. It is topped with crispy wheat tortilla then drizzled with a balsamic vinaigrette. I love Chef Jay's choice of fine ingredients. It is like putting all the best salad ingredients into one dish and F Cafe pulled off a very balanced dish. The balsamic vinaigrette's acidity is somewhat mellowed down a bit by the chef to make the Mediterranean Salad an outstanding appetite opener. 8. Chicken Quesadilla (Php 260) – Marinated Chicken Breast, Mozzarella, and Cheddar Cheese sandwiched between Two Flour Tortillas served with sour cream and salsa. F Cafe and Bar's version of this Mexican-influenced grilled cheese sandwich is more flavorful than the quesadillas from most “Mexican” Restaurants in the city. 7. 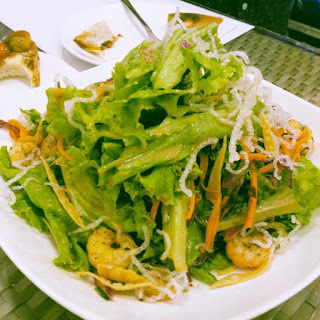 Asian Shrimp Salad (Php 220) – Lollo rosso lettuce, cucumber, carrots, and stir-fried shrimps garnished with crushed peanuts and fried noodles then drizzled with F Cafe's own sesame dressing. A savory salad with strong hints of sesame oil that can heighten your craving to have a food trip. 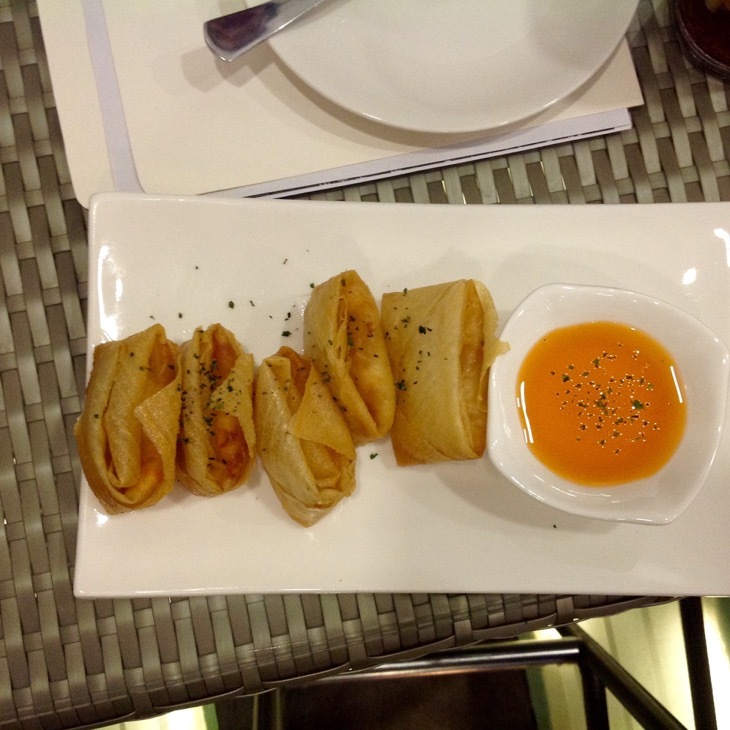 6.Shrimp pockets (Php 145) – Fried shrimp wonton served with F Cafe's own sweet and sour dip. 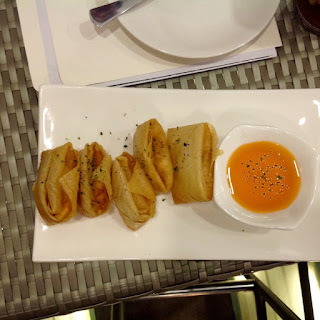 The shrimp pockets look more like a half spring roll than the usual dumpling. It is easy to munch and you can enjoy platefuls with a bottle of beer or a glass of Riesling. The wrapper is so crispy and there is no soggy part in it. The dish reminds me of a popcorn shrimp married to a spring roll. I had an awesome time eating it and I wished there was more. The sauce is pretty spot on. 5. 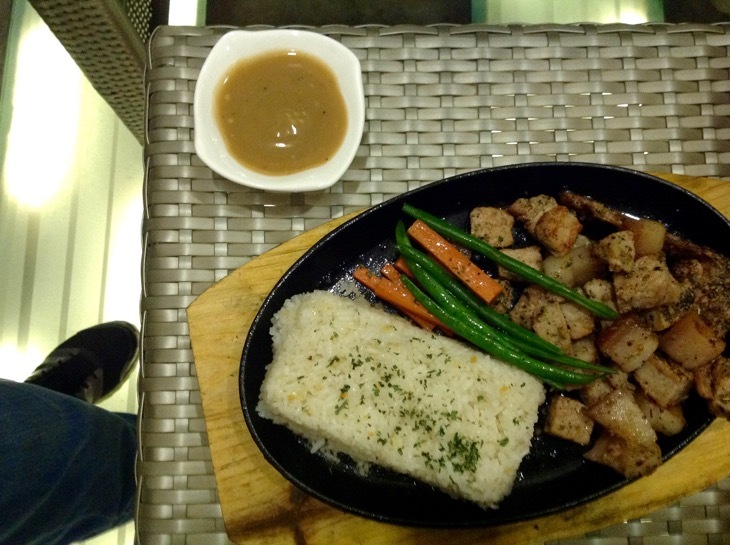 Sizzling Chops and Gravy (Php 265) – 1/4 kilo of pan seared Pork Chops served on a sizzling plate with garlic rice and buttered vegetables accompanied by a homemade gravy. This is a big boy's treat. Pork + Sinangag + Gravy is a sure-fire formula to make me order some extra rice. This is an ultimate #cheatday food. The pork is succulent and the gravy is something I want to pour into the meat and rice. 4. 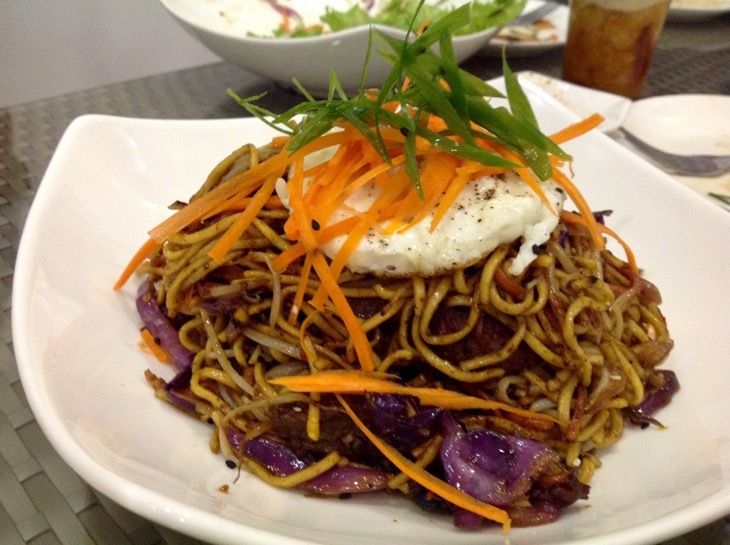 Spicy Asian Pasta with Beef Sirloin (Php 245) – F Cafe's version of Malaysian Mee Goreng. Stir-fried Egg Noodles with vegetables, and beef sirloin cooked with a special Asian sauce and Sambal paste. The Asian Pasta is Spicy, Sweet, and a joy to eat. It is a slightly milder version of the fiery Mee Goreng, which is popular in Malaysia, Indonesia, and Singapore. 3. 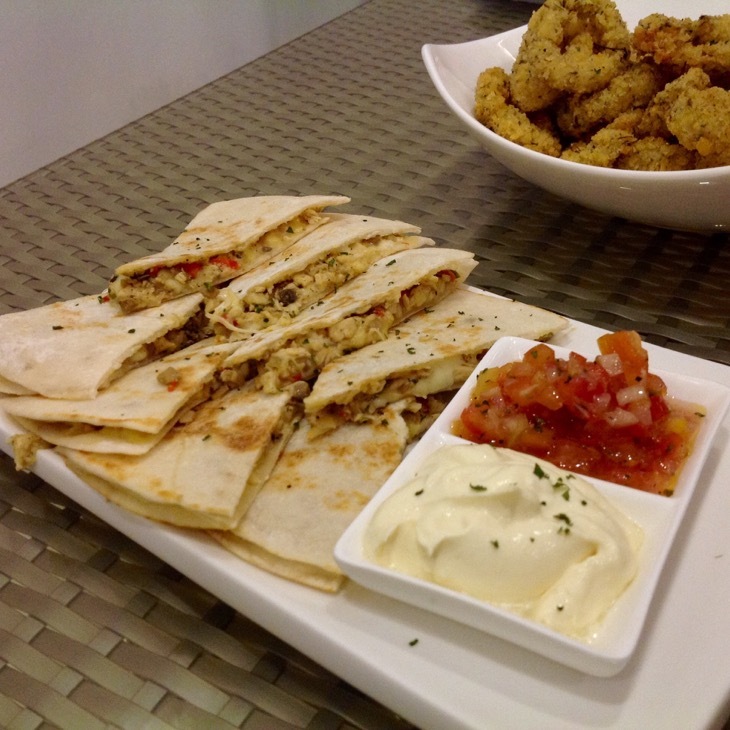 Smoked Pork Quesadillas – For the night, Chef Jay showcased a quesadilla that features smoked pork shoulder. The delicious pork "sandwich" makes you feel that you are in Texas. The hickory smoked meat elevates the unassuming quesadilla to a different level. 1. 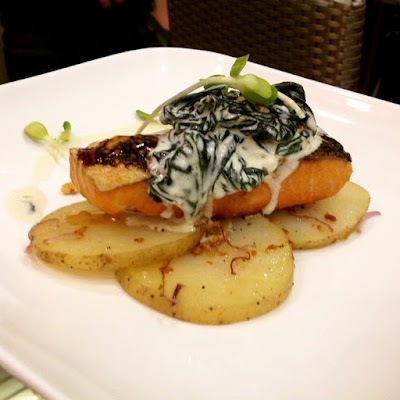 Soy Glazed Salmon Fillet (Php 375) – 185 g of seared Salmon fillet coated with soy glaze accompanied with creamy truffled spinach and pan fried Lyonnaise potato. 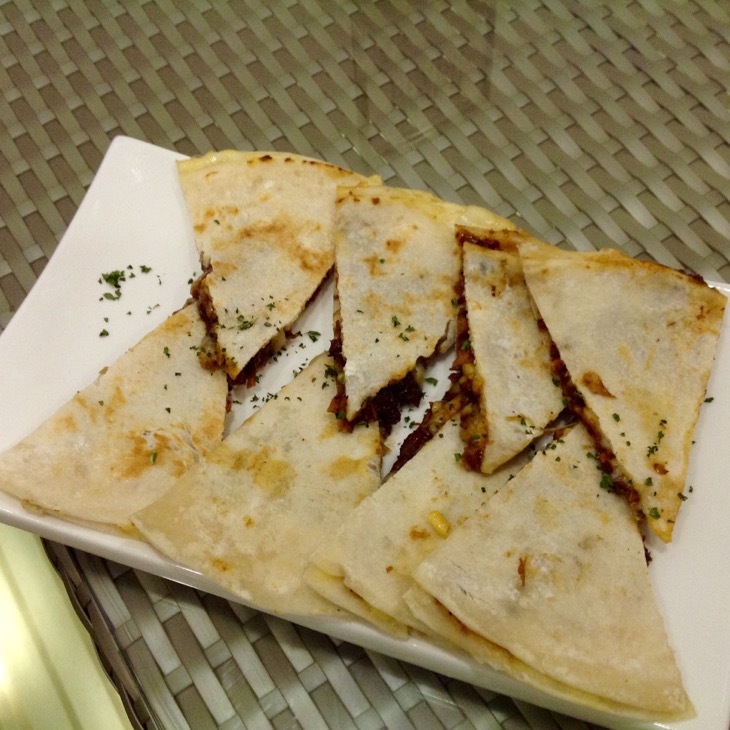 This is the consensus top pick among the main dishes at F Café and Bar. The owner and the chef vouches for this elegantly presented seafood offering. The dish is the epitome of Chef Jay's mastery of fusion cuisine. The technique is mostly French. The bien cuit salmon is stacked on a bed of buttery Lyonnaise potato then topped with the spinach. Everything seems French but in a surprising twist, the chef used soy to flavor the fine fish. French technique + Asian flavors = #instantfavorite . The restaurant can take you to different places in one meal. One can have an appetizer from Mexico, a salad from Thailand, and a main course from U.S.A., Asia, or Europe. Chef Jay's fusion menu is filled with global influences that surprisingly go well together. 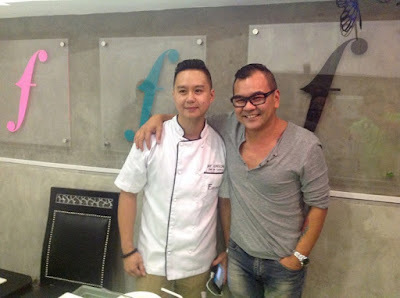 I would not be shockedd if F Café and Bar becomes one of the most visited fine dining places in the city. In the age of #foodporn, presentation plays a key part in having a perfect dining experience. A lot of diners even in fancy restaurants would pause and take a photo before a meal. F Café and Bar leaves no compromises on this aspect. Most–if not all– of their dishes, are Instagram-worthy. What good is a beautiful dish if it does not induce a #foodgasm and a #happytummy. 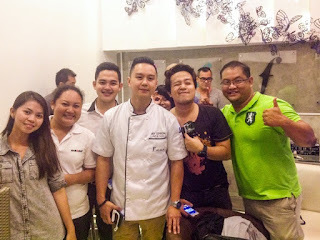 Chef Jay Jonson's creations are a delight to the tongue and tummy. There is a distinct flavor in each course that makes an internationally-inspired dish suited to the Filipino palate. Sometimes it is adding some simple yet familiar ingredient or a subtle adjustment in the sauce that gives the dishes a potentially eclectic acceptance. If you love to try some amazing culinary creations in a relaxing setting, you have to check out F Café and Bar. This restaurant is a fantastic place to start if you wish to embark on a gastronomic journey. I will surely come back to this place. 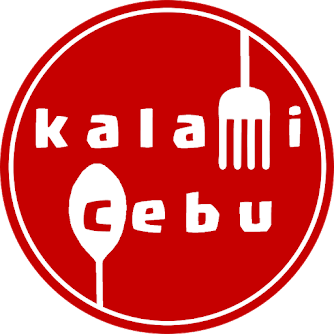 The Gallery at Mabolo is now the home of two of my favorite restaurants in Cebu.